Back when I taught at a predominantly White, selective liberal arts college, I came across a book called Acting White? Rethinking Race in ‘Post-Racial’ America. Their critique made me wonder: Do America’s colleges and universities act the same way toward Black students in the admissions process? What I found is that historically and predominantly White institutions are more likely to embrace Black students who don’t profess an interest in racial justice. In other words, similar to how the authors of “Acting White” argue that White employers like Black employees who see themselves as people first, and Black people second, my study found that White colleges like Black students who see themselves as students first, and Black students maybe second or third or fourth, if at all. 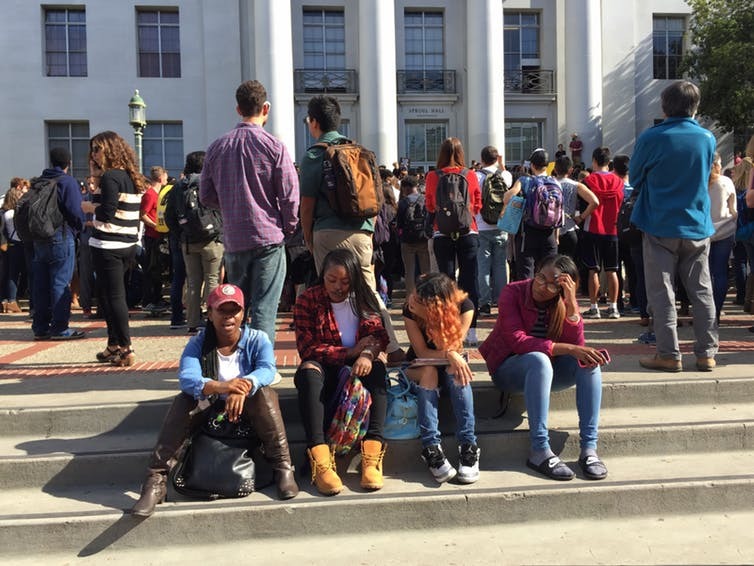 It also matters because this is a time when Black students are facing hostile environments on campus. At Yale, for instance, earlier this year a White student called police on a Black student who was napping in a common area. I would argue this is a time when America’s college campuses need more students eager to fight racism, not just acquiesce. It’s not that White colleges don’t want Black students – many do. A 2014 report showed that nearly all enrollment leaders at hundreds of public and private historically and predominantly White institutions indicated a goal to enroll “diverse students.” Research shows this often means Black students. To investigate whether White admissions counselors were screening Black high school students who don’t adhere to the color-blind imperative, I conducted a nationwide audit study. I began by generating and testing a list of distinctly Black names, such as Lakisha Lewis and Keshawn Grant, that would signal to White admissions counselors that the students who were emailing them were Black. I then created an email account for each name. Next, I created four email templates that represented Black students interested in 1) math and English, 2) environmental sustainability, 3) African-American history and culture, and 4) anti-racism. In each one the fictitious student asked if he or she would be a good “fit” for the school based on their interests and activities. I sent a random sample of 500-plus White admissions counselors at the same number of private, historically and predominantly White colleges across the United States, two of the four emails from two fictitious Black high school students approximately one month apart. I selected small or medium-sized colleges and universities from U.S. News & World Report’s 2013 list of best colleges. Noteworthy, too, is the finding that Wwhite admissions counselors were just as responsive to moderately race-conscious Black students who participated in culturally resonant activities, such as a jazz band and gospel choir and who mentioned the phrase “cross-cultural understanding,” as they were to Black students who revealed no interest in racialized involvements. This suggests, in other words, that it was not simply race consciousness, but a critical race consciousness – one that unequivocally challenges the validity of color-blind ideology – that seemed to be unappealing to some white admissions counselors. Importantly, the screening pattern I uncovered doesn’t necessarily show that admissions counselors are purposefully discriminating against anti-racist Black students, but it doesn’t preclude it, either. Whatever the case may be, there are clear, concrete and immediate steps that administrators can take to curtail this racially discriminatory practice. Some may think the solution is for Black students who actively fight racism to masquerade as something that they are not. One problem with that approach is it’s difficult, if not impossible, to be vocal against racism and not leave evidence of one’s anti-racist activism in their digital footprint. For that reason, I focus my solutions on what institutions can do, not how Black students should comport themselves to fit into a White environment. Second, schools should institute policies requiring admissions counselors to respond to all inquiry emails. Currently, the National Association for College Admission Counseling doesn’t have any best practices for email or inquiry response, according to an association official I spoke with for this article. Might this intervention come at a financial cost to colleges and universities? Perhaps. But it should not be a prohibitive one. Either way it is necessary. If some White admissions counselors don’t even respond to an inquiry email due to a Black student’s commitment to racial justice, how can they be trusted to treat these students fairly at the application stage?